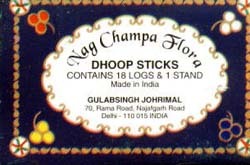 Madhuban Nag Champa Flora: Finally! A dhoop made in the Nag Champa tradition. This Nag Champa is made with Nag Champa and a hint of Jasmine, very nice mix! 18 - 2" dhoops and 1 stand.